The 2200 is a completely new architecture compared to the 1200. We replaced the Motorola 68K CPU used in the 1200 with the Cirrus Logic 7312 (which is an ARM Ltd, RISC processor). This means that the 2200 can render, and process about 60 times faster than the 1200. It may not be immediately obvious, since the 1200 was pretty good at this, but if you were to hold them side by side, you would notice the difference in drawing pages as you flip them fast. The battery change on the 2200 was made for costs. A battery in a case and the associated connectors and mechanical parts (battery door, etc) are a significant cost. The goal is to produce a product that competes with the 1200, but can be sold for a lot less. Very few people were buying new batteries, so the decision was made that people would prefer to pay less than to have the removeable battery. The first ColdFire Family member to be announced was the MCF5102. As the first chip in the family, it has been designed to be both ColdFire ISA compatible and 68EC040 compatible. These extensions to the ColdFire instruction set allow Motorola customers to use the MCF5102 as a bridge to future ColdFire processors for applications requiring the advantages of a variable-length RISC architecture. The BDM stuff on the Coldfire for the REB1200 isn't really useful for much besides verifying the chip at manufacturing time. Unlike the JTAG ports on many newer CPU's (like the ARM series), the JTAG stuff on the Coldfire (especially the one in the 1200) is nearly useless. Trust me, it was frustrating when I was first bringing up the OS on the 1200 and had to rely on an external Logic Analyzer and a fairly expensive "clip" just to see the code flow. It's best to think of the Coldfire in the 1200 as a 68040, that's really the way it works for almost all purposes (code wise). The bus is multiplexed, so that's like a Coldfire, but that's about the extent of it. on and off the ethernet chip, battery charging, startup and reset, button interrupts and almost anything related to IO. It remains on even when the device is powered off because it constantly updates the battery status. The display isn't memory mapped, it uses an Epson controller chip to draw to the device. 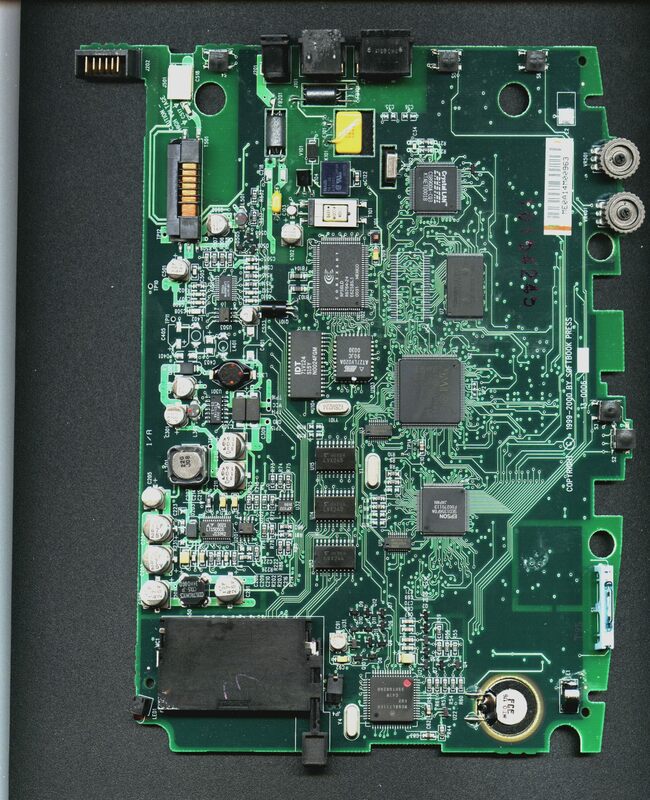 The Epson chip has it's own memory and accesses are always through the Epson controller. There is a way to access it in a pseudo memory mapped mode, but I honestly forget how. Figure out the info on the Epson chip and it will probably make more sense. I think the AMI chip is the address decoder and also might contain the modem and serial UART stuff. I think it's primarily responsible for demux-ing the address/data bus and doing the memory mapped IO. But I also think it contains the serial UART for the modem. I think we baked in an "off the shelf" UART for the serial stuff, but I can't remember if that included the modem or not. RAM starts at 0xF0000000 (I think, we moved the memory around through the different products and I'm not 100% sure). Ethernet is probably at 0xE0000000 (I remember there being something about using the "E" to mean ethernet) display is either at 0xC0000000 or 0xD0000000 (which isn't the memory for the display, but the registers for the Epson controller). There's also some flash ROM in there and the interface to the 6811. Can't remember specifics and probably shouldn't refer to notes (I'm in enough trouble for this message). If you have a firmware image (which SOMEONE out there does), you can probably pretty easily map the memory out. Keep in mind the firmware lives in the flash ROM and executes there, but the stack will always be set into the RAM. does mean that if you have a snapshot of what the bookstore sends to upgrade a unit, then it won't accurately describe the memory map of the devices. The Coldfire does not have an MMU (it uses an ACU instead), so it's not possible to run Linux without doing some significant work. You would have to port the non-MMU version of embedded Linux to run on it (and it doesn't currently support this chipset). The memory for the Epson controller is in a rotated mode. Since there were no options for a "portrait" mode controller (at the time), we ended up doing funky things with the controller to get the memory to map to the display (since both wanted to be in landscape mode). The CF interface only supports IDE mode. That means any card that uses IO mode (serial cards, WiFi cards, ethernet cards, etc) will not work. The bus was overloaded and there just wasn't any way to bring those signals to the CPU. Keep in mind I haven't worked on the 1200 since 1999, so my memory may be fuzzy (or just plain wrong) on some of this. > where the display, compact flash and CS8900 are mapped in the Coldfire's memory? > 6811? Any idea what it does? > What is the AMI Device at u2, a fpga? > trying to write code to run on the Reb1200. > GEB2150 or at least it is supposed to be. The OS is very similar, but as far as loading the firmware, they are two completely different animals. The GEB1150 uses a boot ROM to load an encrypted file off the filesystem and puts that in memory and then executes that code. The 2150 (or 1200) simply uses flash ROM and just lets the CPU execute from that address space at boot time. It's one reason no one ever has any problems with the firmware on the 1200/2150, but you constantly see "my 1100/1150 won't boot" messages. 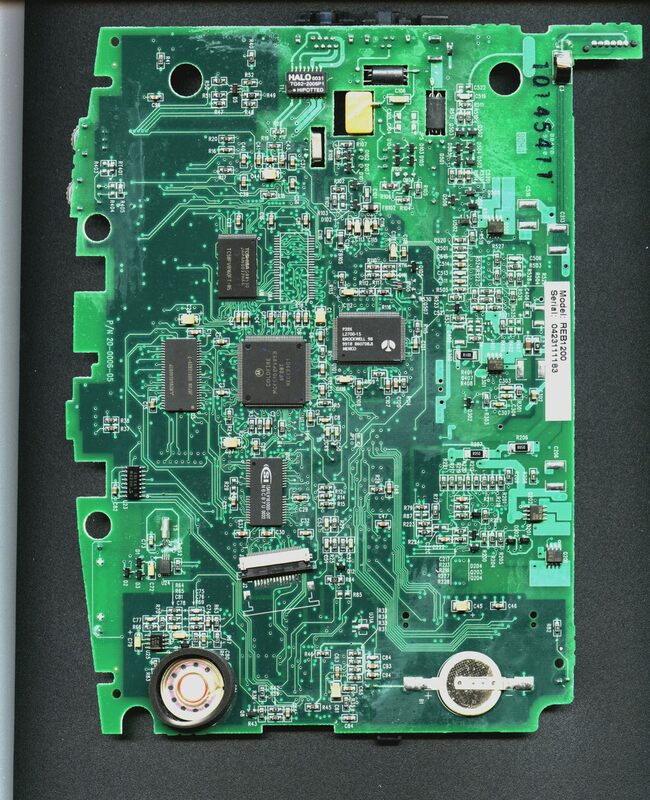 motherboard, so there's not even an option to replace them. font metrics as that is needed to calculate line and page breaks. > font metrics as that is needed to calculate line and page breaks. is pretty much identical to the NFNT resource format on a Mac. The major difference is that there is no FOND resource to describe families, that's all done by resource ID. words, it might be possible to extract that info from the freely available publishing tools (rather than trying to pull it from the ROMs). The only change to the fonts in the 5 years I worked on the product was the addition of the Euro character in the end of 2002. I think firmware earlier than 3.2 is missing the Euro character in some fonts.